I wake up thirty minutes later than I planned and a couple of the children are already awake…and one of them is even sitting in “my” chair and drinking from “my” cup. It’s ok, I calmly tell myself. I can sit quietly and flip through my prayer journal after our family school time and while the kids are doing their animal chores before breakfast. My husband calls and tells me I need to balance the checkbook because he needs to buy a new tag for his truck and can I find a state income tax form for our sixteen-year-old daughter. And the soccer coach texts a change in practice time and I need to text back saying my fourteen-year-old won’t be able to make it at that time. So I stumble through some prayers and intentions as I make the breakfast, balance the checkbook, text the soccer coach and call the library for a tax form. It’s ok I calmly tell myself. I can sit down with my prayer journal once school starts and everyone is doing their school work or quietly playing. back that he gave the nine-year-old because he doesn’t understand that when you give something away it’s no longer yours. One of the laptops used for math is freezing up and the other is making a funny noise. The thirteen-year-old went outside to see why the dog was barking and then saw a bird which made him remember to check the hay barn for eggs because a chicken has made a secret nest in there. So I try to recall God’s presence while I’m walking around looking for the thirteen-year-old. After lunch, once I tell the five-year-old and nine-year-old to go to rest and quiet and the olders are (supposed to be) finishing up school, then I will finally be able to sit down with my lovely prayer journal. I fall asleep! And when I wake up it’s time to start dinner, straighten the house, answer final questions about school and start getting my people ready for soccer practices. It’s ok I calmly tell myself. I can use those beautiful prayers I composed after dinner while sitting in the car at soccer practice. By the time I finish delivering my people to their respective practices, drop off over-due library books and find a parking spot near the fields, a sweet momma comes up to the car for a visit, or a nineteen-year-old, living from from home, calls, not because she’s homesick–of course, but just to chat. While I’m out my husband, out on his own errands, calls to tell me we are out of cereal and milk; could I please stop and get some on my way home since I’m closer to the store than he is? Once stinky, sweaty children get in the car, I head for the grocery store, only to be reminded, I need to put gas in the car first. By the time I get home, it’s clean up, evening animal chores, night-night snack, bath time, family prayer, and goodnights. And I realize I went the entire day without once opening my prayer journal. and our Guardian Angels. Next, we worked on our Scripture and Catechism memorization. When my husband calls just a brief inspiration of thanksgiving for his dedicated service to our family enters my heart and seeing my seventeen-year-old walk into the room gives me a moment’s pause as I feel intense gratitude for my vocation as her momma. Looking into the big brown eyes of my five-year-old and his brother’s clear blue ones again remind me of the blessings I have been given. Computer problems remind me of the abundance we have and the ability I have to homeschool my children. And walking around outside, hunting down a thirteen-year-old offers me the opportunity to enjoy God’s amazing creation…including a wandering child. Do you see? Each and every moment could have been turned into a prayer, a conversation with God. Some of them were a prayer just by lifting my heart and mind up to God. These weren’t long and formal prayers. They weren’t composed and poised prayers. Most of them probably didn’t even look like prayers to anyone else…me included. Each time my heart was turned to gratitude, I prayed. Each time I reflected on my blessings, I prayed. Each time I served someone else, I prayed. These are not the ideal prayers every single day, but they are prayers. So don’t get hung up on supplies and form, location and position. I began using a prayer journal made with a small three-ring binder. You can find that supply list here, Prayer Journal Video and Resources. I am now transitioning into a Carpe Diem Planner, Marigold color. I like the protective cover, the pockets, and the overall feel of my new prayer binder. I’ll post more in this new journal soon, plus video. Thank you Jenny for reminding me that a prayer doesn’t have to be formal, that the Lord is with me the whole day, not just when I am sitting or kneeling or standing. 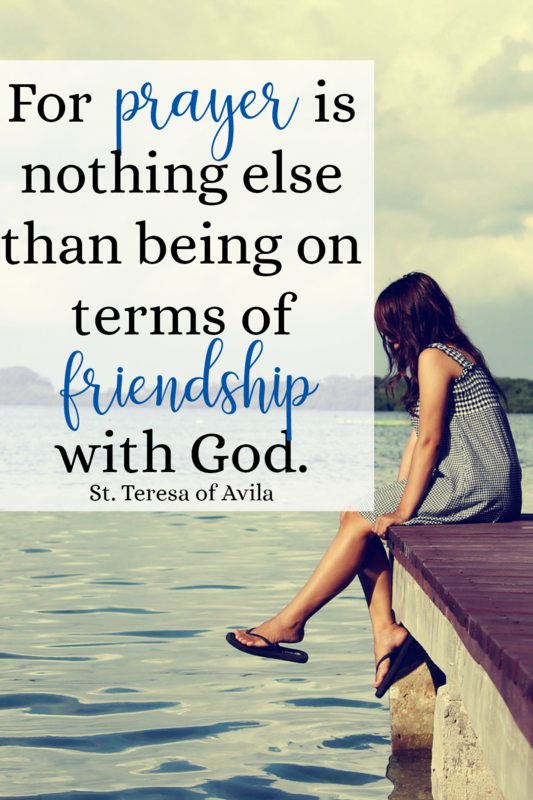 Thanks be to God that we have each other not only to pray but also to remind each other of all the things that we forget. Girl, He knows our heart and what He’s called us to. He will gently nudge us in His direction, but He won’t bury under condemnation because we said our Morning Offering in the carpool lane. I so often have days like that too – Despite the best of intentions life messy, wonderful life gets in the way! Thank God! God is in it all! Thank you Clare and He is so, so very good to us! A journal would be really great for accountability! But if we get hung up on “must pray x minutes x days a week” — that’s legalism… not relationship. I completely agree with you Brittany. My journal isn’t so I can pray x number of prayers in x number of minutes, I use it as a conversation starter, a memory keeper of the things I want to say and not forget, of the things God has said to me that I really don’t want to forget. Amen! Amen! Amen! Praying throughout the day, whether it’s a formal let-me-sit-down-and-pray-straight or simple “Thank You!” or “Help Me!”…it’s all prayer. And they are all heard by our God. P.S. yes, I am alive. I took a hiatus of sorts from media during Lent. I’m still in remission (another prayer of deep gratitude – Thank You, Lord! ); and I’m still working on mitigating the collateral damage from the treatment. Girl!!! I have been emailing you! Have you gotten any of them? I have been wondering where you have been. I thought maybe moving Mrs Pea into the house was a tougher transition that expected. So glad to hear you are alive and well!! 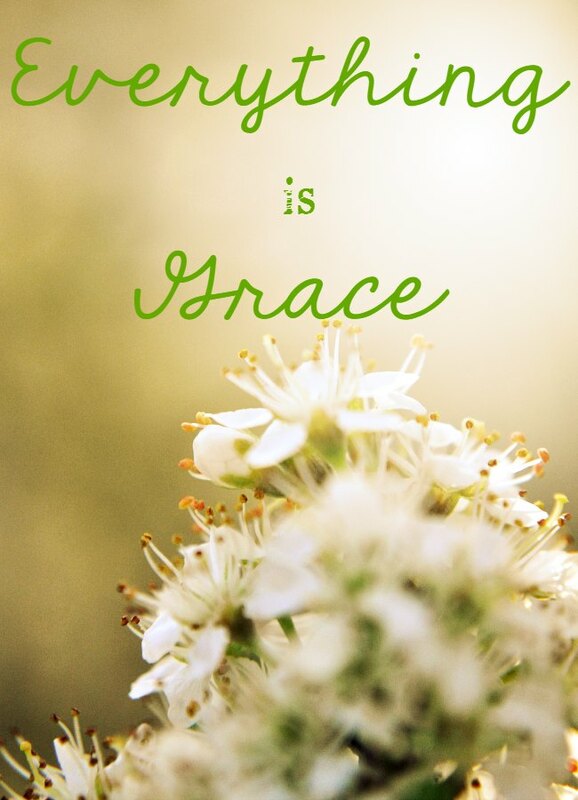 Just beautiful…and so true to life for all of us…God is in it all…with you! I can relate to your post! My spiritual director reminds me every time that I “am not a religious”. My vocation is as a married woman with many to look after (husband, grandchildren, mother-in-law, etc.) Praying as you describe is most pleasing to God – we offer everything to Him and praise Him is doing so! It’s so funny that so often years ago I used to think I could pray better if I were a religious. But that’s not my vocation so I pray better where I am, doing what I’m supposed to do. True life true life! I work all day in front of a computer and I sputter out prayers in between working as things come to my mind…. we can make short and simple prayers, too, just like you said! Great article! Thank you so much Clare for your encouraging comment. Yes, whenever and wherever…chasing kids, sitting in front of a computer…any type of work can be for the glory of God. I think you nailed the truth about everyone’s day. Ideally we all should set time aside for the Lord, realistically life doesn’t go according to our best laid plans. But it doesn’t mean we don’t pray. We should really be in constant communication with the Lord, “without ceasing”. I”m glad to hear this resonates with others, this prayer on the go! The enemy tries his best to distract us from the many blessings of God that we receive through prayer……….. 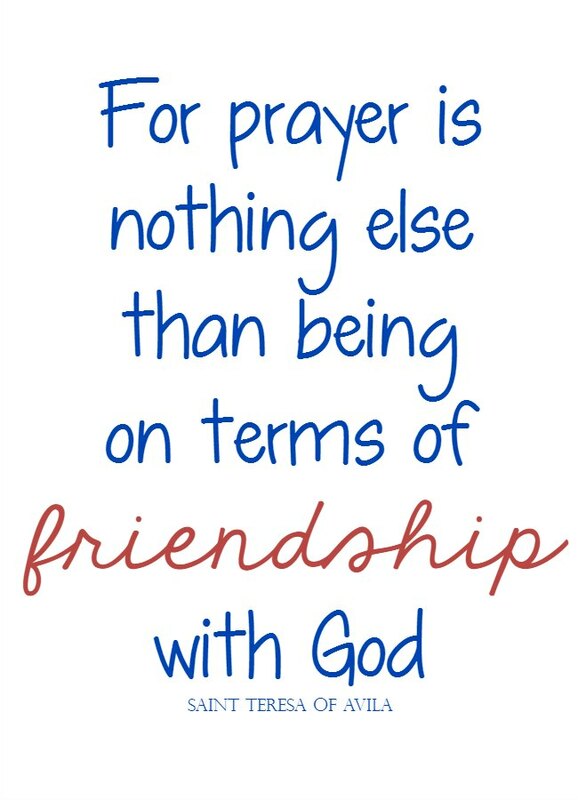 Thank God we don’t need to be so formal in what we say when we pray – as long as we are just talking to God… Thank you for sharing your prayer journal !! Hi Rene, yes distraction is a key tool for the enemy to use against us! Thanks for the visit Michelle. I’m glad you found this enjoyable. I just loved this post Jenny. Your life is soooo real…and you turned it into prayer…all of it. This is what my Spiritual Father has been teaching me…service…*LOVE in action*. This is what God asks of us as mothers and wives. Thank you for sharing this and I appreciate the reminder to do the same.